In my search for bathroom color schemes for our remodel I found this very unique look. 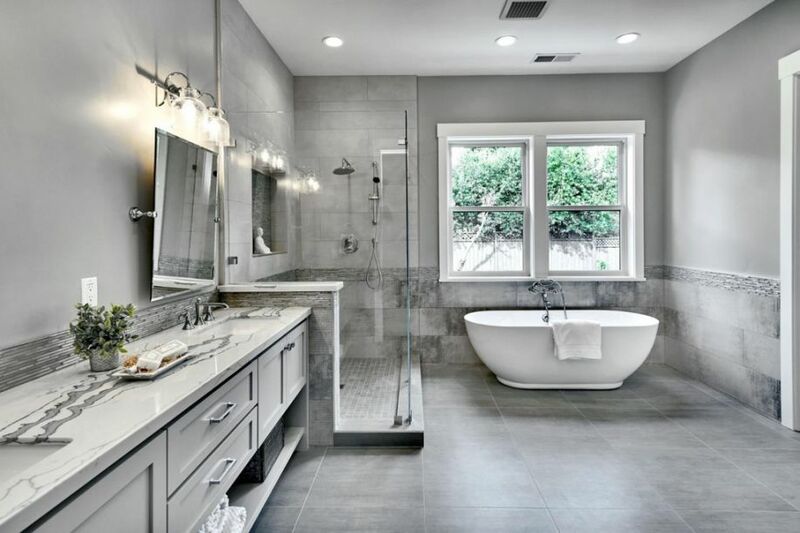 Of course we have all seen grey bathroom tiles used in the past few years, mostly in marble and sometimes in a more contemporary wood grains. I loved this unique twist on the look by pairing the very cool colored tile against ultra warm wood as an accent color. Most people are too scared to combine these two undertones, but I actually love the look. I think that it is a great twist on the popular bathroom colors 2019, and presents a way to make something different while still staying trendy. I definitely want to recreate a look like this in, not only our master bath, but in other main living areas of our home like the kitchen. Whenever I am trying to decide on bathroom color schemes for a new design project, I like to first pick out the tile. I often find that my designs are inspired by particular bathroom wall tiles that I have seen at the store or in a catalogue, and that the rest of the decor follows once I pick them. Some designers draw their inspiration from a particular piece of artwork, textile, or paint chip -- but for me it is usually all about the tiling. 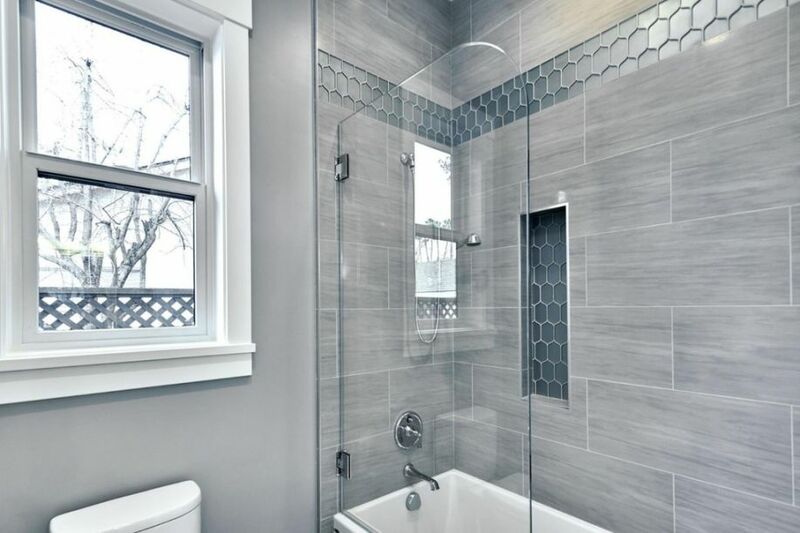 In this particular space, the blue grey honeycomb accent tile is the piece that really anchored the rest of the design. I love the mixture of charcoal grey and a classic wedge wood blue in the shade, and the glass gives it so much depth. In general, I am turned off by warm bathroom color schemes with a lot of beiges and ivory shades because I prefer a cooler and crisper look. 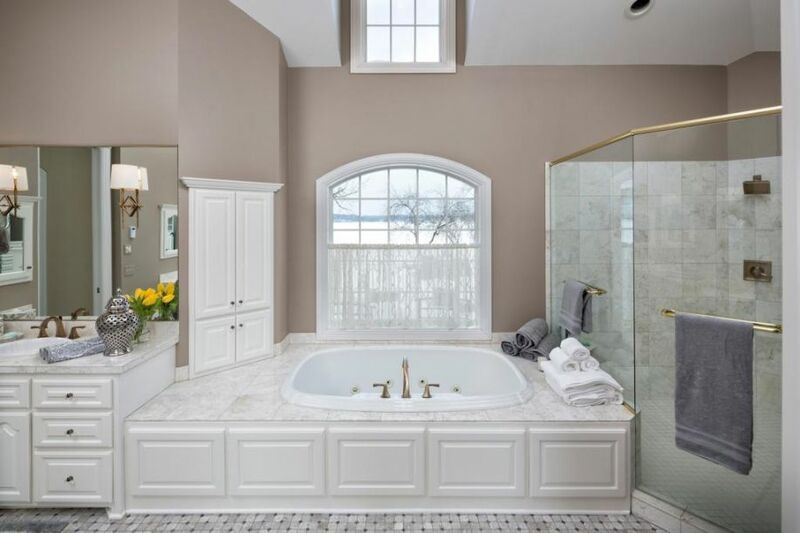 However, I really love the bathroom ideas in this room because it incorporates both cool tones throughout the marble as well as warm tones in the paint color and wood. Ordinarily, I would pair a nice dove grey or pure white against marble tile like this but I actually really like the contrast between the tan wall paint and the crispness of the white and grey marbling. Not only that, but I think that the rich cherry wood actually pairs quite nicely with both the tile and the paint and makes it look very elegant. I love bathroom color schemes like this that have a bold color on the walls to offset the white panelling and marble tile. 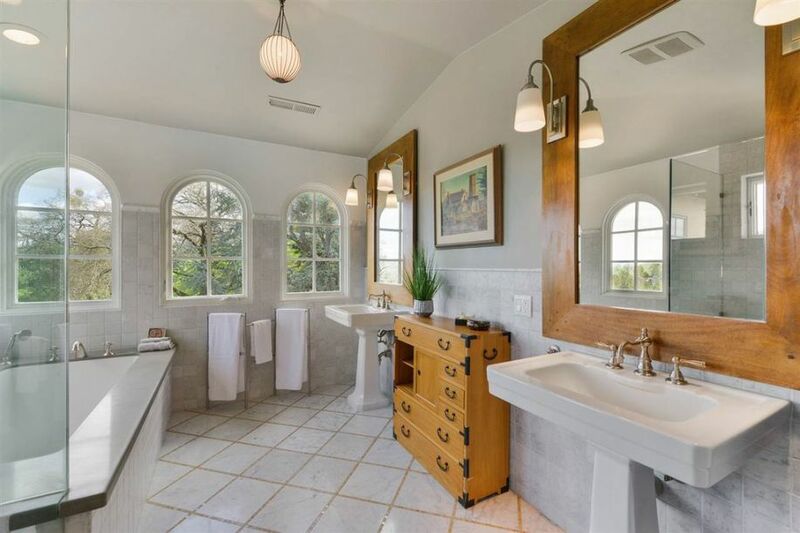 A lot of photos that I see and articles that I read say that whites and light grays are the best bathroom paint colors, but I actually have to disagree because I think that when you use those shades, everything blends together and there is no real delineation between each decorative feature. Beautiful white panelling and trim does not pop as much as it could if you have a wall color that blends right into it, and marbling looks so much more impressive and luxurious against a rich shade like this tan. I especially love how they paired the a warm shade of metal with all of the cool tones, because you rarely see a gold bathroom faucet paired with a look like this. I am very into monochromatic bathroom color schemes especially with a lot of grey and white. 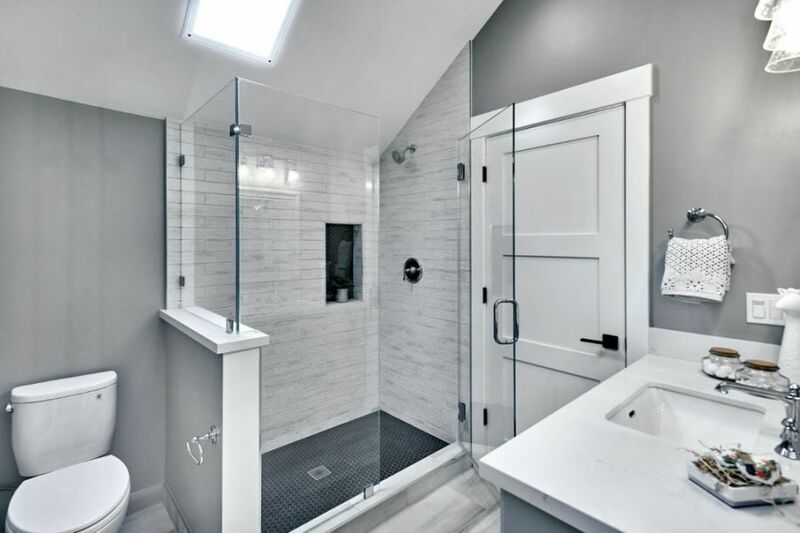 I think that white and grey bathroom ideas look very clean (both decoratively and physically) and can be paired with both modern style homes as well as the more traditional. The thing that I particularly like about this space is that the designer limited the colors to only two (white and grey) but added so much texture and pattern in those shades that there is a ton of visual interest throughout the space. There are about 4 different types of tile as well as a contrasting countertop, beautiful wood vanity, and a lot of chrome accents. I definitely love how this combination of modern bathroom colors created a very eclectic space, yet it remains serene because of the limited shades used. I know you have probably seen so many white and grey bathroom color schemes on here, but I just have to share one more. I was so happy with how our master turned out that I wanted to share photos to inspire others and help provide direction for anybody looking around for small bathroom color schemes (like I was just a few months ago). We went through countless paint swatches trying to settle on the right shade for the room (Benjamin Moore Owl Grey by the way), but we couldn't figure out what would give the space enough design without overwhelming the small floor plan. Both my husband and I knew that we wanted a contemporary look, and gray bathroom paint seemed to be the right choice to achieve this.